Welcome to “One cue at a time”. I hope you enjoy our new video series. We will be sharing everything fitness, movement, mindset, nutrition and life. Techniques, cues, concepts and moments that you can apply to your movement, health and life. Hope these add value to your training and lifestyle and remember to keep moving and grooving. Sebastian is considered a serial entrepreneur starting his first business at the age of 12 and enjoying the challenges of business for over 30 years. He has a passion for creation and believes strongly in process, self awareness, and diligent planning and is here to make an impact in your life. Sebastian is the Founder and CEO of 6 startup companies and has travelled to over 24+ countries with the aim of self exploration. He has also dedicated his most recent stage in life to coaching people towards better lives via his coaching & gym network. He has played world cups in his sport at the top level for his country and is discovering more about himself each day via the diversity of information and opportunities available to him. 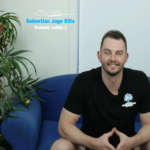 Sebastian now seeks to guide and support more people towards better living and high states of awareness.